The debate which is going on is the reflection of a profound deep-seated crisis in the capitalist and imperialist system. The fact that this debate simultaneously proceeds within the United States, within circles in Africa, Asia and Latin America, [and] within broad communities of students and intellectuals in Europe…indicates the universalization of a particular ideological debate at this time, and it is a reflection of the real crisis in capitalism and imperialism. 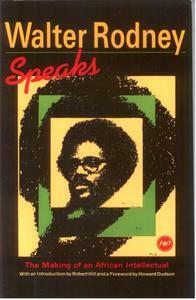 The above and following quotes come from Walter Rodney Speaks: The Making of an African Intellectual, published in 1990. This work represents transcripts of conversations between the Institute of the Black World (IBW) and Rodney during a two-day period, April-May 1975, in Amherst, Massachusetts. The sessions aimed not only to probe the historical contradictions in black struggles and in Black America, but also to review Rodney’s own intellectual and political development. [Caribbean] people have been operating within the aegis of capitalism for five hundred years, which is longer than the working class in the United States. We have been confronting capital, firstly on the slave plantation, and then subsequently on that same plantation after slavery. It is not quite the same as a European capitalist framework, but the conditions of work are in effect capitalist and class alienating – that’s the important thing. The consciousness which springs from this is quite obviously a class consciousness and has been there for many decades and comes out sporadically in various kinds of revolts… It didn’t take the working class a long time to understand…that neo-colonialism hasn’t meant any real change in their lives. [I]n Guyana there has been the problem that historically the working class has always been divided mainly because of the manipulation of the planter class. The Indians were introduced into the society specifically to counter and break the development of the black working-class movement that arose in opposition to conditions after the end of slavery. So it is not simply as though Africans and Indians co-existed without any relation one to the other. Economic competition between Africans and Indians was deliberately created within the construct of the old capitalist order. What do we do with the large number of unemployed? Thirty-three percent of [the Caribbean] population is unemployed. Do we call them “lumpen proletariat” and with all that that implies – that they’re outside the working class, that they are even in some ways anti-social – or should we understand that this is a fundamental part of the development of capitalism in our society? It is part of the thrust of capitalism to keep our working people from even having the right to work. In Guyana, racial politics persist. CARICOM is dead. Black America faces mass incarceration. Global inequality is entrenched. Social turmoil grows worldwide. Emancipation remains illusive.